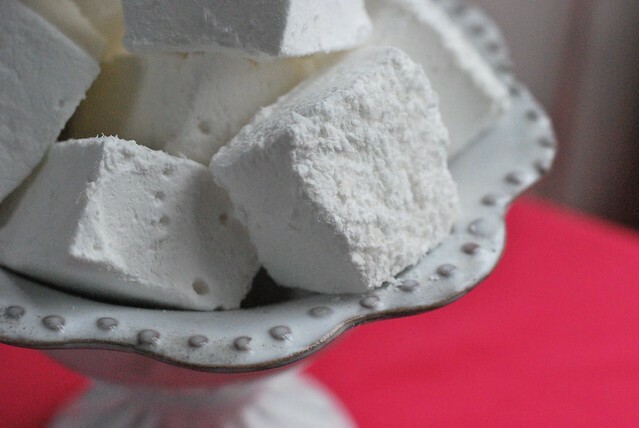 Homemade marshmallows are a SUCH a great weekend project (so great that I'm probably going to be tackling another batch on Sunday). They take less than an hour to make--much of which is inactive time spent leafing through a magazine while your stove or mixer does all the work--and then just need a few hours to set. I'd avoided making them for years because I was terrified that they would turn my kitchen into a sticky, sticky mess (something which I am handily able to accomplish myself without the addition of boiled corn syrup), but I was happily surprised to find that was not the case. All you really need is one pot, one mixer bowl, and a pan. Eugene did ask me to point out that our dining table looked like a cocaine lab due to the puffs of confectioner's sugar I kept spilling everywhere during the cutting and photographing process, but that's nothing a damp cloth can't clean up! And the results...oh the results are SO worth it! I readily admit that marshmallows are one of my favorite things to eat. 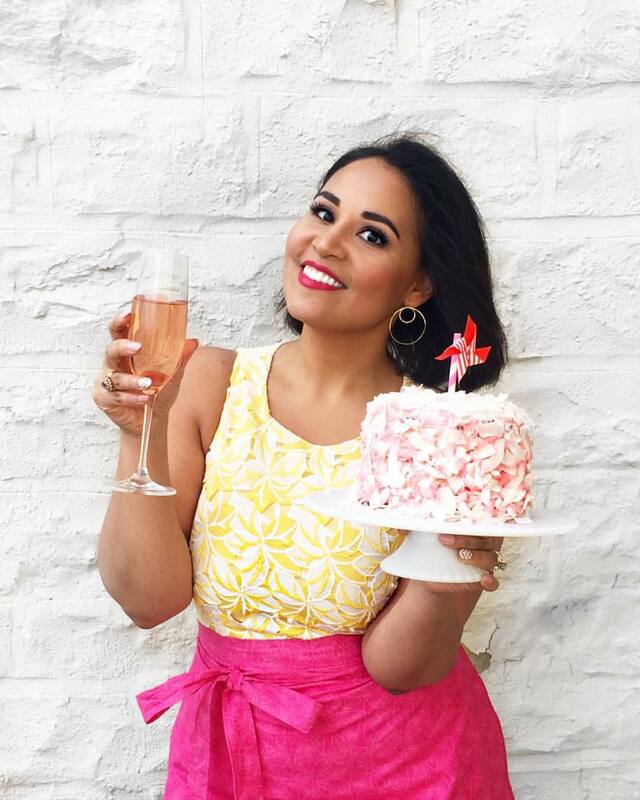 As much as I try to avoid packaged and processed foods, marshmallows are the one thing that I will likely never give up--those soft little pillows of vanilla and sugar and sweetness are absolute perfection. I love them a little melted, speared on a fork and held over the flame on my gas stove for a few seconds until they blow up fat and charred. Eugene rolls his eyes when he comes home from work on an average Wednesday to find me, sticky marshmallow in hand, the air in our apartment sprinkled with that faint hint of burnt sugar and summer. And then there are times when during a commercial break I drop a few into a mug and pop them in the microwave, watching with fascination through the glass as they blow up five times the size then deflate slowly. I squash them between graham crackers and melty chocolate chips and bring them back to the couch. 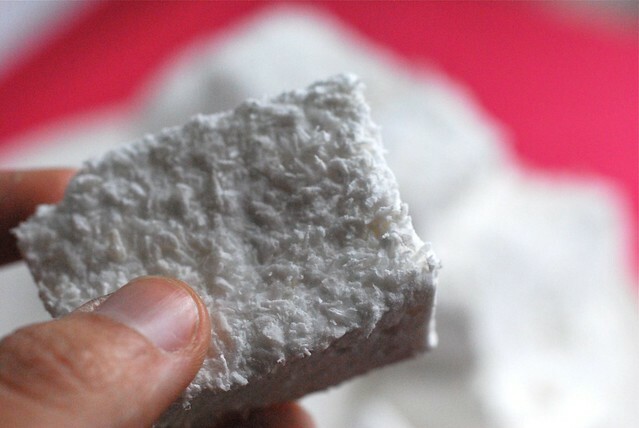 Though the original recipe called for regular old coconut flakes, I used unsweetened dessicated coconut (like this kind, which I get at Whole Foods) with these marshmallows because I think they're sweet enough that they don't need the added sugar. I think the fine texture also worked perfectly and gave it just the right hint of coconut flavor. Tip: To cut these, I love to use a pair of sharp and clean kitchen scissors. It snips right through them perfectly without a lot of fuss. Combine the gelatin and 1/2 cup cold water in the base of an electric mixer and let dissolve. Prepare an 8x13 inch pan by lining the bottom with the dried coconut. Meanwhile, combine the rest of the water (1/2 cup), sugar, corn syrup, and kosher salt in a medium saucepan with a heavy bottom and high sides. Insert a candy thermometer and let cook over medium heat until the sugar dissovles and the syrup reaches 240 degrees (about 10-15 minutes depending on your stove). Once the syrup reaches the right temperature, turn the mixer onto low speed and pour the sugar syrup in slowly until it's all in. Raise the mixer to high and let beat for about 15 minutes, or until the mixture is very thick and doubled in volume. Pour in the vanilla extract and mix in thoroughly. 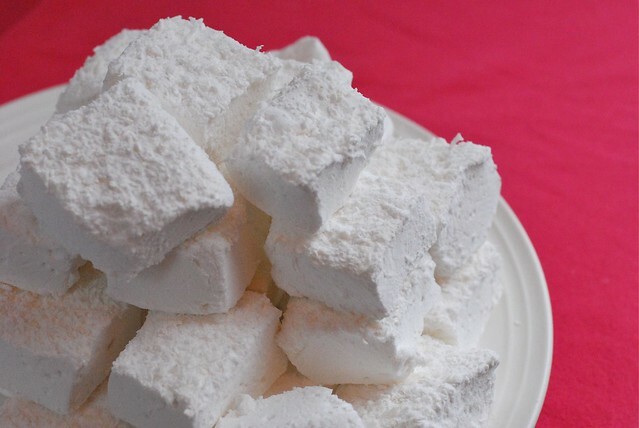 Spread the marshmallow into the prepared pan and used your hands dipped in cold water to spread it evenly. Whisk together the confectioners sugar and the cornstarch and sprinkle over the marshmallows evenly. Let set for at least 4 hours ( I always leave overnight) then cut into cubes using clean and sharp kitchen shears. Dust with more confectioner's sugar and cornstarch and keep in an air-tight container at room temperature.